The Blue Jays slowed down the Red Sox offense enough on Tuesday night to stop Boston's five-game winning streak with a 7-3 Toronto win at the Rogers Centre. 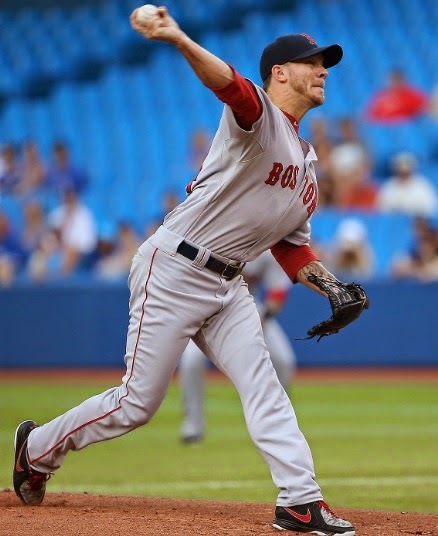 The Red Sox were held in check by Blue Jays starter A.J. Happ for six innings. Happ scattered seven hits and walked one in holding Boston scoreless. Jake Peavy took the loss, allowing five runs on eight hits and three walks in 6.1 innings. He struck out seven as his record dropped to 1-9. His last win came back in April against Toronto. The Red Sox scored their three runs late on a solo home run by David Ortiz in the top of the eighth inning and a two-run blast by Stephen Drew in the ninth. Ortiz also had a double. Shane Victorino and David Ross had three hits apiece.